While resting in Thailand, we pondered where to go next.. Thailand is a fantastic place to visit, and that’s why so many people do, but as a consequence, Thailand is just a bit too, well, easy. It’s not that we’re some kind of backpacking masochists trying to rough it through the hardest adventures on the planet, but we started looking for a change of pace, a change of culture, and a change of food. That’s why we chose Bangladesh..
Old Town, Dhaka, Bangladesh. Chaotic, noisy and dirty. Brilliant. We got our first impression of the chaos that was waiting for us on the flight from Kuala Lumpur to Dhaka, which was almost exclusively Bangladeshi businessmen. It’s the first flight I’ve been on where the pilot saw fit to “test” the brakes on the way to the terminal to get the recalcitrant passengers to sit back down and stop emptying the overhead lockers – and even that didn’t work! We really felt for the poor flight attendants forced to run crowd control. The taxi ride from the airport into downtown Dhaka was much the same as I remember the taxi ride into downtown Mumbai on a previous trip to India back in 2008.. our taxi pulls up.. its windscreen is cracked from one side to the other and I swear there’s not a single panel without a dint, a scratch and paint from another manufacturer’s catalogue. There aren’t any seatbelts, and it’s obvious that the little money spent on this vehicle goes into the massive CNG tank in the boot and the maintenance of the horn. As we set off and crawl over the speed bumps, the suspension creaks like an attic door in a horror movie, and the grinding sound of the brakes suggests the callipers are cutting a musical groove into the discs much like a gramophone record – if you played it back you’d hear fingernails down a blackboard. Then we meet the traffic. It’s mayhem. Buses, trucks, cars, 3-wheeled tuk-tuks, motorcycles, cycle-rickshaws and bicycles compress into each junction filling every gap, like different sized flakes of glitter in a snow globe settling on the bottom. For a brief moment there’s calm, then the lights change and it’s all shaken up again to the deafening sound of acceleration and electric horns. To say we get comfortable with the situation is too generous, we sink into our seats and just accept the apparent anarchy around us. Right now at least, we’re still alive. Then we reach the motorway and everyone adds speed. That’s it, we’re definitely going to die. Half an hour later we hear the sound of fingernails scratching down a blackboard in an attic, which means we’ve arrived at our hotel. Welcome to Bangladesh. 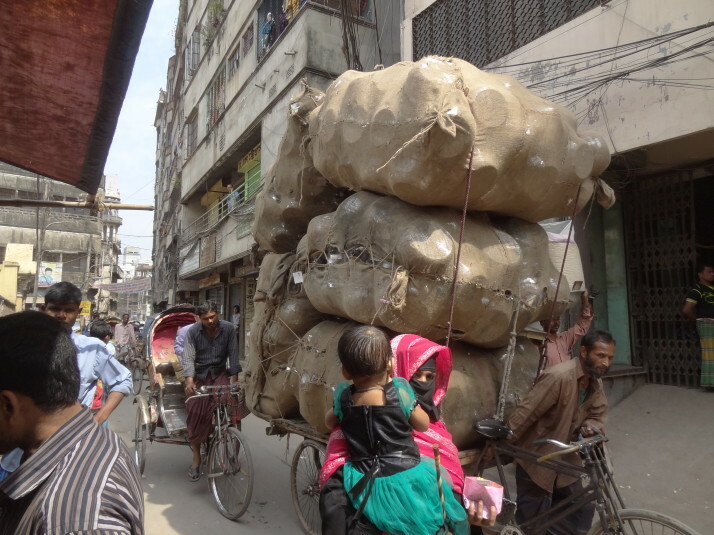 The next morning we headed out.. Dhaka is crowded, noisy, dirty, and hot. We love it immediately. The first thing that stands out is the staring. 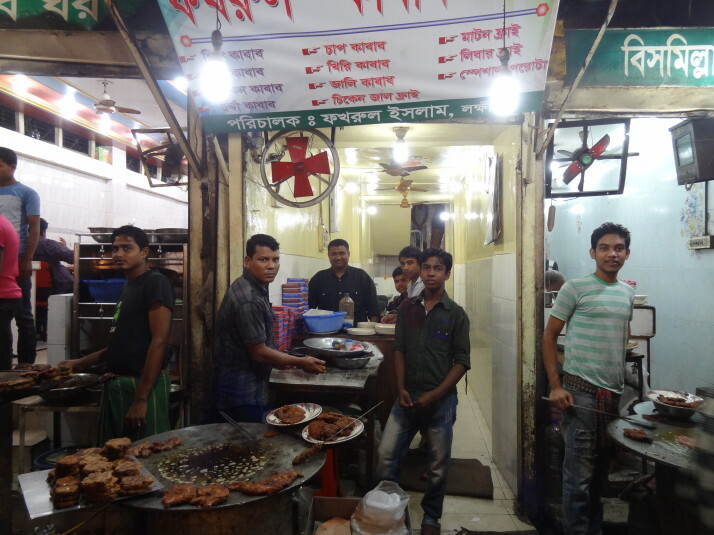 Now, you’ve seen photos of us here on this blog, and yep, we can be pretty funny looking, but unlike China where people stopped what they were doing and gawped, Bangladeshis are a whole other level of curious. They will go out of their way to get a prime staring spot by walking up to us as if to start or join a conversation, but instead they’ll just stand there, right in front of us, maybe a step away, and gawk in wonder. Often with a blank facial expression and their mouth agape too. We realise that as Bangladesh doesn’t get many foreign tourists, we could well be the first white people they’ve seen in person. That’s quite a thrill for them and for us, and also quite a responsibility to behave as befits our home nation.. it makes one feel like an ambassador! 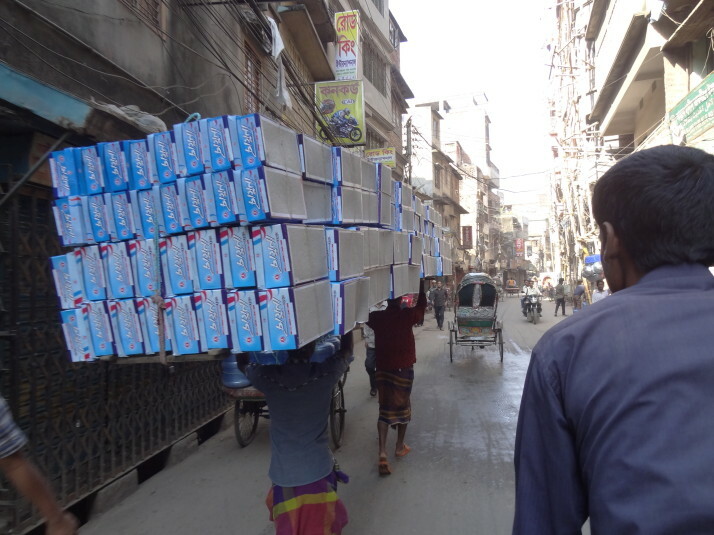 But I can tell you, smiling solidly for 3 days, meeting, greeting and nodding to everyone we saw as we walked through Dhaka is pretty darn exhausting. The muscles in our faces ached. We started looking forward to the solitude and respite of our private hotel room. 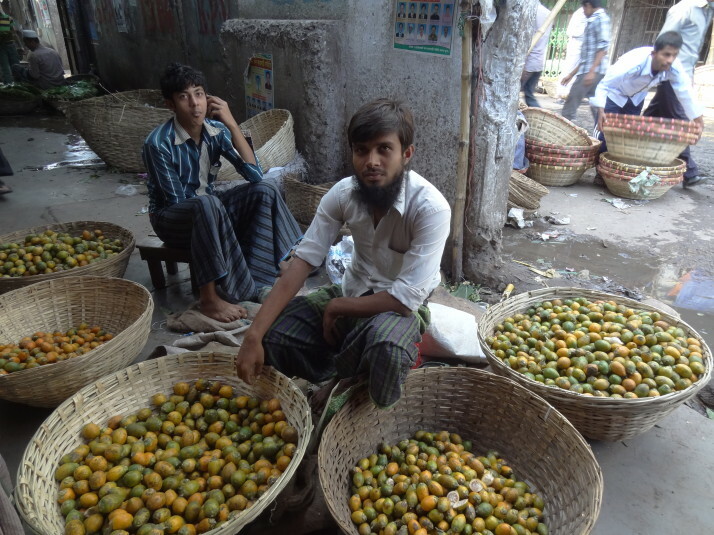 Just wandering through the crowded, organically twisting streets of Old Dhaka is our kind of adventure. With no pavement on which to pause for breath, we become part of the city as we are carried through the streets by its unrelenting rhythm. 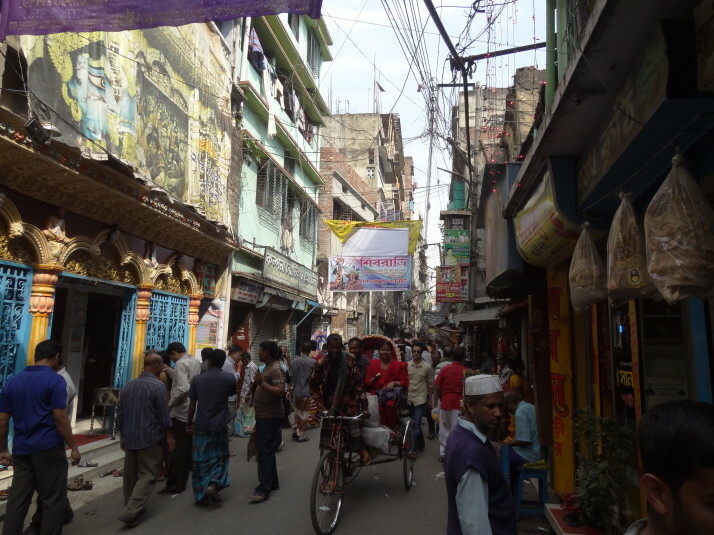 The businesses and shops of Old Dhaka are organised as we’ve grown accustomed to in much of Asia – plastic tubing street, metal working street, bicycle street, etc. 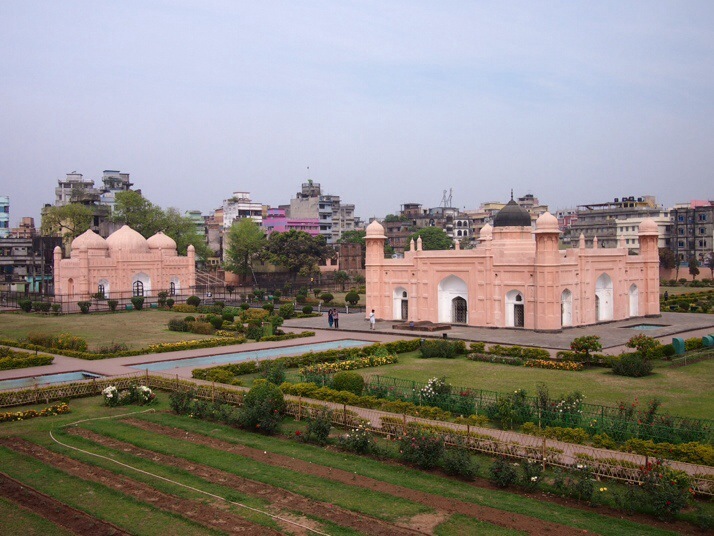 Construction of Lalbagh Fort began in 1677 under the direction of Prince Mohammed Azam, the third son of Emperor Aurangzeb, although he handed it over to Shaista Khan for completion. However, the death of Khan’s daughter, Bibi Pari (Fair Lady), was considered such a bad omen that the fort was never finished. 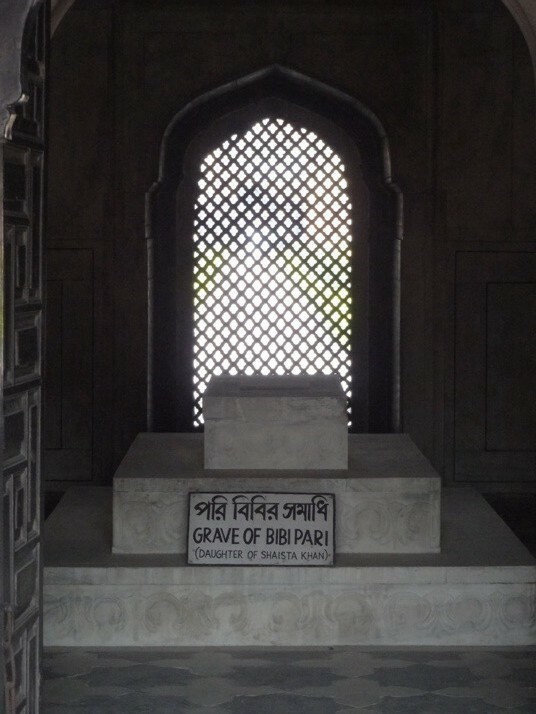 Bibi Pari’s body now lies entombed – her life cut short, in a fort incomplete. We got up early and as a result we had the place pretty much to ourselves, despite our rickshaw driver insisting all the way there that it didn’t open for another 2 hours – suggesting we take a tour of Old Dhaka in the meantime – only to find the gates open when we arrived and the first (Bangladeshi) tourists just leaving. 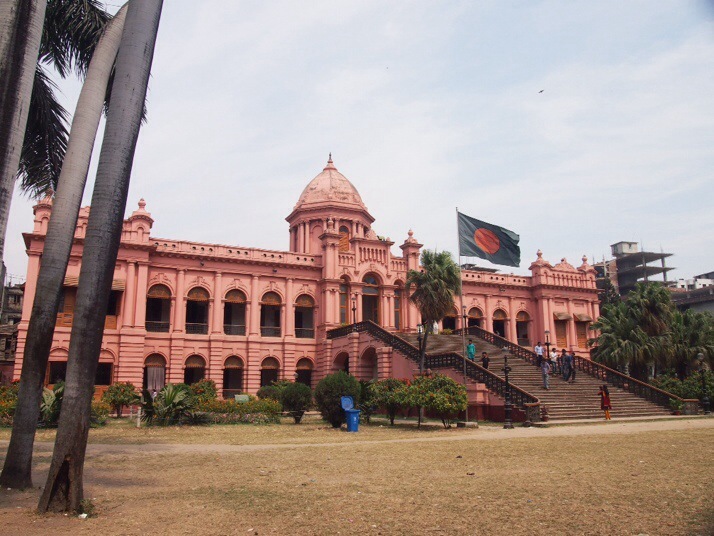 We loved the early morning light on the beautiful pink buildings, the beautiful gardens and the fantastic sense of calm and space given its surroundings at the edge of the bustling, busy narrow streets of Old Dhaka. 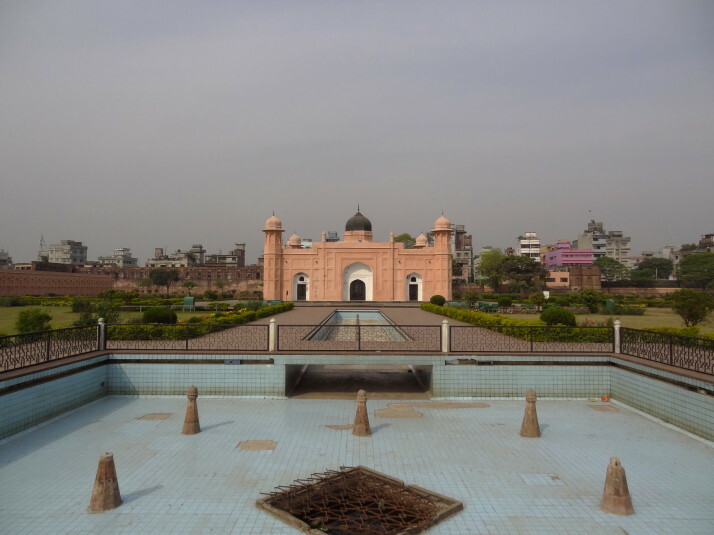 With the major reconstruction works completed, the Ahsan Manzil or Pink Palace looks very impressive from the outside and overlooks the main Buriganga river, which spreads out into a delta, and then the Bay of Bengal. The first hall’s exhibit shows the dilapidation they started from after years of abandonment, and it’s an astonishing feat of repair. Attention is now being given to recreating the various rooms and their decor from a collection of old photographs taken by a visiting guest when the Palace was at its most splendid. 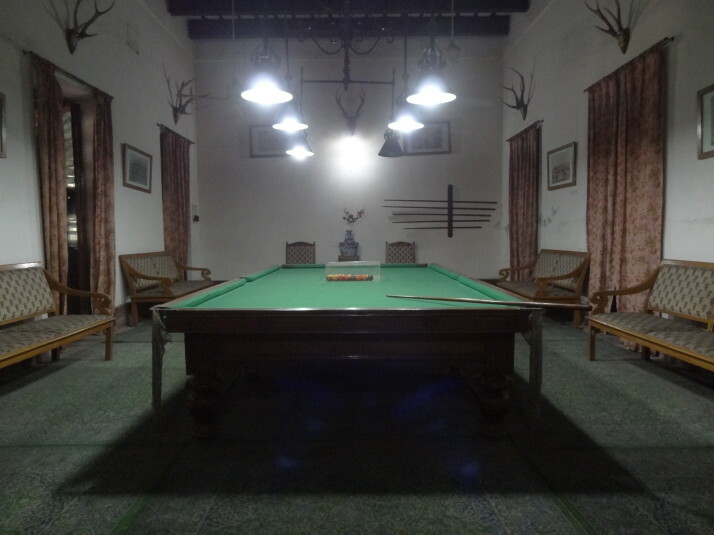 They’ve only completed a handful of rooms so far, but the dining and billiard rooms have been done to a very high standard – they look exactly like the photographs on display! 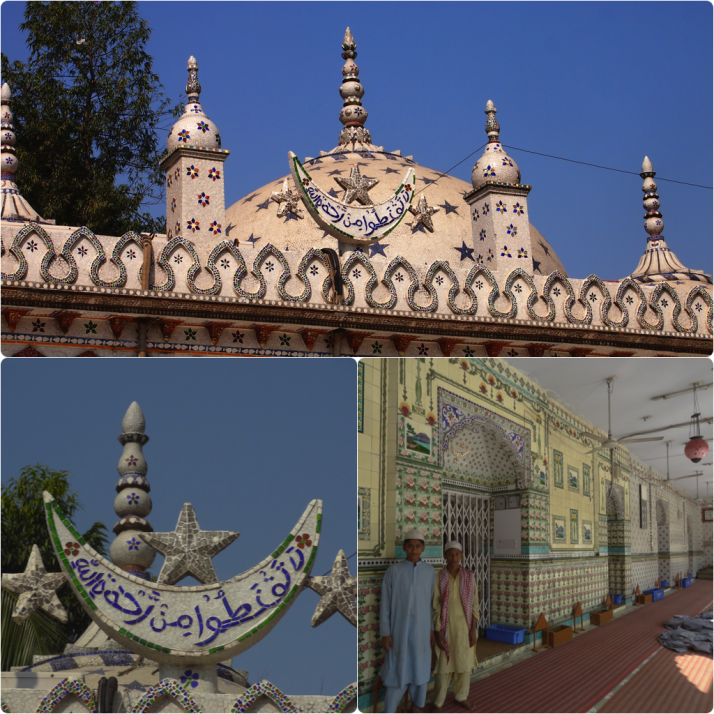 The Star Mosque is not as big as we thought it was going to be, but it is more beautiful than we had imagined, given the scant description in our guidebook. 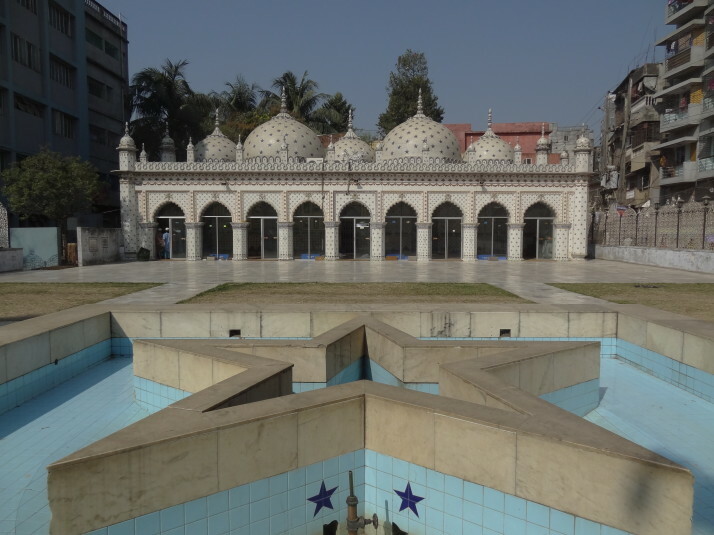 This is a working mosque, and as we admired it from the courtyard, we were approached by a worshipper with excellent English who was visiting Bangladesh from Indonesia. After a round of handshakes (and many questions), he scolded the local boys for attempting to shake Julie’s hand as in strict Islamic teachings, it is forbidden for men to touch a woman who is not permissible to him (i.e. those other than his Wife, Mother, Sister, Daughter, etc).. The markets in Bangladesh are like no others we’ve visited for two reasons: firstly, everything is on show, from the live descaling and gutting of fish to the beheading of chickens in a barrel, to cows heads on the floor with their meat hanging above covered in flies; and secondly, and the thing we’ve found most delightfully astonishing, the stallkeepers actively want their photograph taken. 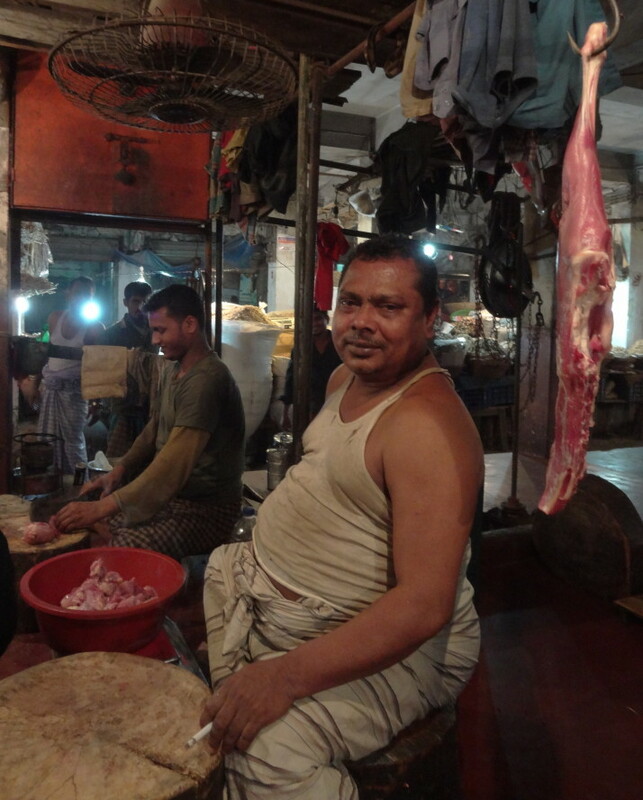 Here are just a few of the great shots from the riverside market near the ferry terminals – I think we might do a post solely of market photos from around Bangladesh..
Bangladesh Liberation War Museum. 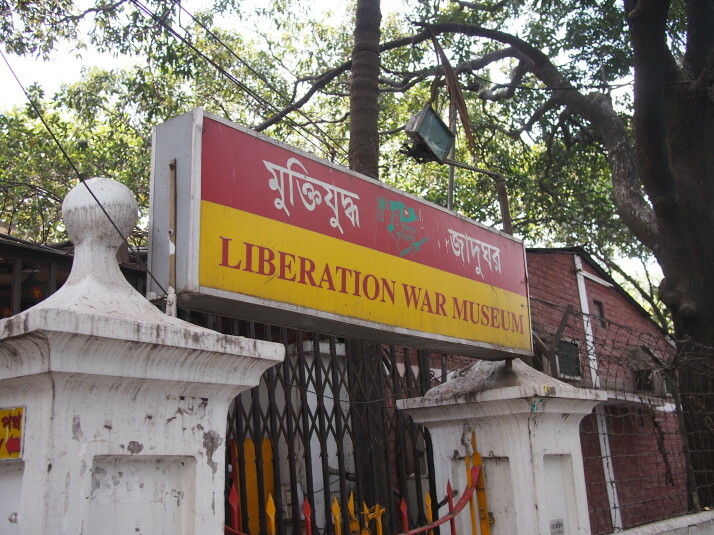 Surrounded by so much barbed wire we thought we were entering a Prisoner of War camp..
Hidden down a backstreet in what looks like a tenement area of high-rise non-descript concrete flats, Bangladesh’s Liberation War Museum is chock-full of artefacts and information about the bloody birth of the nation we now know as Bangladesh. Sadly, we weren’t allowed to take pictures inside the museum. Among the exhibits is a nice tribute to my Mum’s favourite Beatle, George Harrison, who sang about the Liberation conflict which resulted in over 7 million refugees fleeing to India. George, together with Ravi Shankar organised the first major music event to raise awareness and financial aid “The Concert for Bangla Desh“, which was the inspiration for Live Aid, some 14 years later. 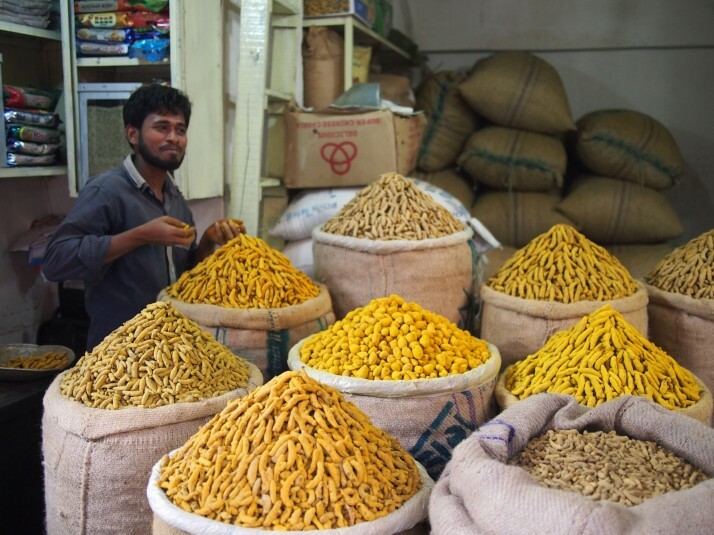 Dhaka is sensory overload turned up to 11, and it’s exactly what we were looking for. 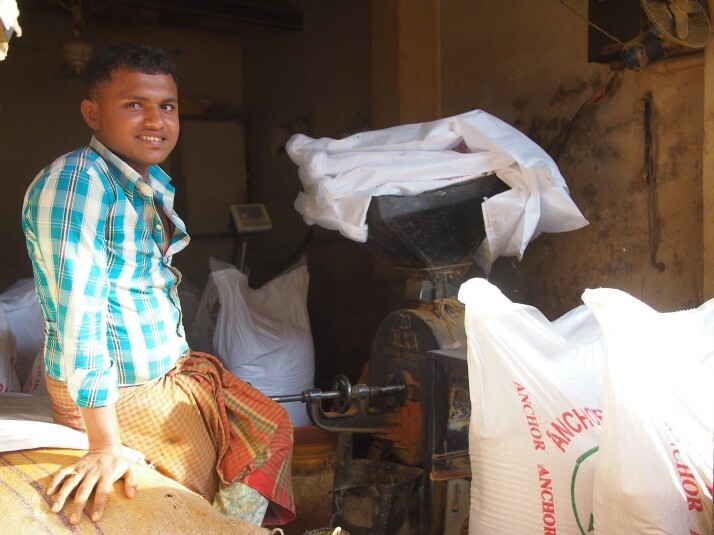 This entry was posted in Places and tagged Bangladesh, Dhaka on April 1, 2014 by Andrew.